Each 0i corresponds to one of the four ray types associated with upgoing and downgoing rays at both the source and the receiver. The path geometries and associated sign conventions are prescribed in the RAYMODE L-path chart illustrated in Figure 4.13. These paths may be compared with those described previously in Figure 4.2. The cycle counter (q) represents the number of bottom reflections. Each segment is then evaluated by either wave theory or ray theory. A special option is available to the user for surface ducts in order to incorporate the effects of leakage (diffraction effects). This option is exercised only for that wavenumber segment for which it is appropriate. If the special surface duct option is not exercised, then the segment is evaluated using the normal-mode approach. However, if the number of normal modes for a given segment exceeds ten, then a multipath expansion of the four parts of the integral is employed. If the segment contains bottom bounce paths, then ray-theoretical methods are used. 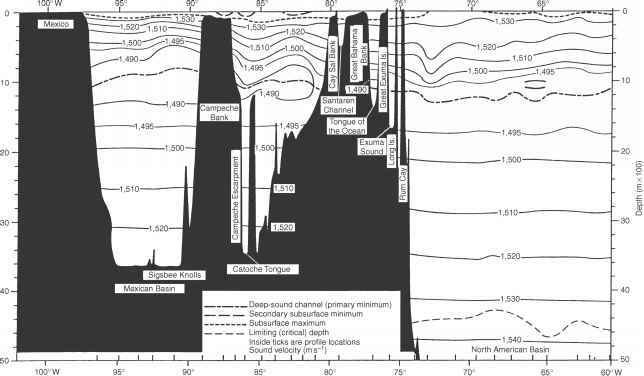 At frequencies below 45 Hz, a normal-mode solution is used to evaluate propagation through the sediments. There is also a separate high-frequency routine that is used for frequencies greater than 1 kHz. The key parameters controlling the decision for the method of solution are the acoustic frequency and the physical environment. Consequently, slight variations in the problem statement may possibly result is unexpectedly abrupt changes in TL brought about by changes in the method of solution.